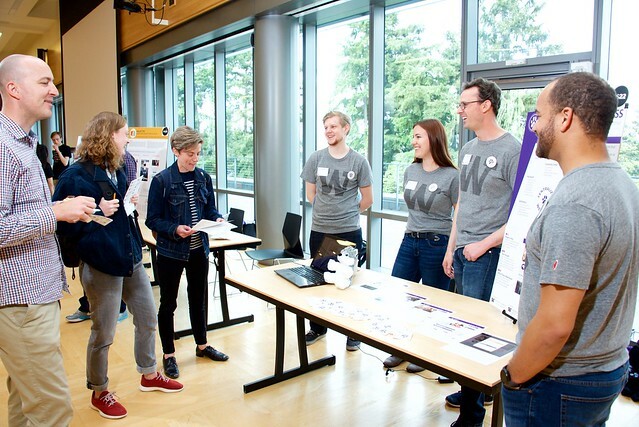 The department of Human Centered Design & Engineering (HCDE) welcomed nearly 500 students, future students, alumni, Corporate Affiliates Program members, and friends for our annual Open House on May 29, 2018. Undergraduate and graduate students presented their Capstone projects and attendees cast votes in the People’s Choice Awards. Guest judges spent the evening meeting with capstone teams about their projects and awarded prizes for best undergraduate project, best graduate project, and honorable mentions in the categories of communication, technology, research, and design. Click through to find the full album on Flickr. All photos by Kerry Dahlen.